My host H�rvard Bj�rgsum took me out today. I saw ancient stone carvings in the valley, the Olympic bobsled tracks, Lilleputthammer and even visited the ski jumps at the Olympic Park. (todays' report contains over 2,500 words. If it gets too much, please warn me). With me sleeping on a stretcher in the living room, H�rvard woke me after noon. Yes, I could use the sleep as we hit the beds last night at 4am. Do I really write that much? I am thankfull that I could use his computer so long! While I was sleeping H�rvard had already read my previous report and was surprised by all the details. I really tell a lot, which is a very good thing, he says. I just hope it is something different than the guidebooks about travelling that only tell people what to expect and how to deal with it. I just can't think of telling all a happenings on one day in a nutshell. We had a brunch with sandwiches different jams and meat filings and watched the latest news on television. Osama Bin Laden says he is ready to come forward, but just come up with evidence and he wants himself be justiced in a muslim court. For me that sound pretty logic. So what are those American flight troops and the Navy doing there in the east? H�rvard is sure of the fact that religions has always caused troubles on our planet, just check our history. I did'nt agree with him, because I see that as a very black-and-white statement. In this time you'll have to study the backgrounds of conflicting people - how they are educated, what they have been told their whole life and how they deal with that - and compare those backgrounds the with the same conclusion of this stufy of other parties in the conflict. Then it still will be difficult to blame it all on the religion of certain people, I guess. But I do think religion is a powerful thing. I know that of the American state Alabama, science books have a little preface in them, saying: "This textbook discusses evolution, a controversial theory some scientists present as a scientific explanation for the origin of living things, such as plants, animals and humans. No one was present when life first appeared an earth. Therefore, any statement about life's origins should be considered as theory, not fact." Today H�rvard is taking me out to see the things that make Lillehammer special. But first he received the Letmestayforaday-gift from me. It was the gift given to me, to pass to my next host, from Taco and Cecile in �lesund. This time he got a windcandle in a ceramic pot, something H�rvard had never seen before. Next to a gift for my next host, who lives in Rygge, south east of Oslo, H�rvard had a present for me too! 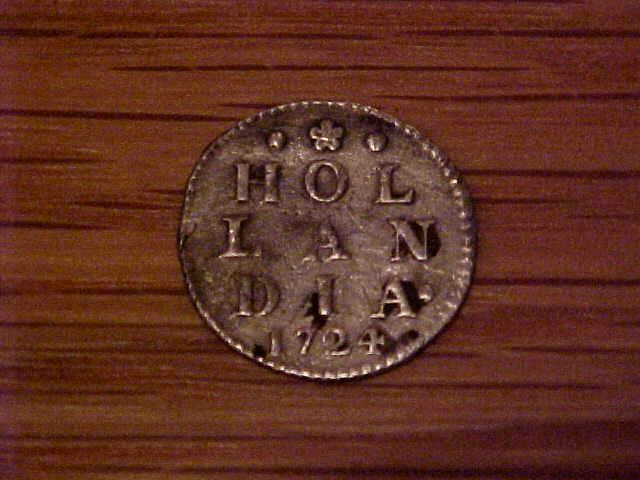 He gave me a "2 stuiver" Dutch coin, dating from 1724, which has been found in the wreckage of the Dutch Akerdam ship that sunk near an island near �lesund. The boat was owned by the Dutch United East India Company, also known as the [url=allserv.rug.ac.be/~sdconinc/VOC/ ]VOC[/url], and was on its way from the Dutch island Texel to Cape Town, South Africa and Bavaria, current Jakarta in Indonesia. But because of a conflict with the British, the boat had to avoid sailing through the English Canal and tried to sail all around the British islands and planned to head south. But due to a heavy storm, the Akerdam never arrived in South Africa or Indonesia, it stranded on the bottom of a bay in �lesund and was found in 1972. On board was a lot of money. Gold and silver coins, to be traded for silk, coffee and rice. I felt very honored to get this coin from H�rvard, even though 29,000 other "2 stuiver" coins were found on that ship. I am now a man with a mission: I will have the coin arriving in Cape Town, South Africa, after a delay of 276 years, as soon as I get there somewhere the coming month. And maybe the coin will ever make it at its final destination: Indonesia. In his car H�rvard drove me to Drotten, which is a few miles up from Lillehammer, to see ancient carvings in rocksides. It sounds pretty dull, but it was quite an experient to walk down a valley towards the river, through a wet and green forrest and to end up down there and see these carvings. (Wasn't it Bon Jovi who sung the song Slippery When Wet?). H�rvard showed me five rock carvings deriving from Stone Age hunters and fishermen. The zone here at Drotten was discovered in 1942. There are seven figures of elks here, as well as a number of fragmentary lines which may represent the remains of more animal figures. The rock carvings have not been dated, but they are likely to be more than six thousand years old. We don�t know whether they are contemporaneous or whether they represent a long period of time. What we do know for certain, is that elk was hunted here more than eight thousand years ago. It�s believed that these figures were cut in order to ensure a good hunt, and to protect the hunter from the spirits which had made their home in the animals. Rock carvings are most often found close to water in Norway. The Stone Age people who cut them (with sand!) depended on both hunting and fishing. After a 45 minutes walk up the valley, back to the car, I was pretty exhausted. I should walk a little more, I guess. From Drotten we drove to the Olympic bobsled tracks. It was quite different than I knew them from television. Just in the middle of a green forrest there are these concrete tubes passing by. In the summer season these tracks are used for trainings with bobsleds on wheels, but today the tracks were closed as they were getting ready for the wintertime. This is when cooling elements in the concrete will freeze the water sprayed on the track, making it a real ice track. It's told that the prince of Monaco loves to practice around here for a while. Norway doesn't really have meaningful bobsled teams, according to H�rvard, but it is always fun to see the Jamaican bobsled team do some practicing here. Eventhough they would never go for the gold, just for the fun. From the bobsleds tracks we drove to �yer, a bit more up north, but in the same valley, where the marvellous Lilleputthammer is located. Believe me or not, but some people managed to rebuilt the complete main street of Lillehammer in Lilliput-style. After Lilleputthammer we visited the Olympic Park in Lillehammer itself, where on the hill, the 120 metres high ski jumps are located. In 1994, this was the place where the Opening Ceremony took place with over 40,000 people crapped together, watching a big egg erecting from below the arena, showing this massive troll. And maybe you remember the fireworks. They were extraordinary for Olympic standards! The games were also the most environmentally friendly Olympics in history as well. Norway's recycling and energy-saving techniques were so successful that the IOC revised its procedure for choosing host cities as a result. Most of the stages and lighttowers have been taken down and now the ski jumps will be used as Lillehammer hosts the coming World Cup and Nordic Cup, coming up in November this year. But after 1994 there hasn't been a real winter in Lillehammer anymore, so all fingers are crossed at this moment. The winter of 1994 was the best winter that Lillehammer had ever had. There was enough snow, everybody was organised in a superb way and there was absolute nothing to complain about. With the current snowfall at the east coast of South Africa (and I am really not making this up; small villages had to be evacuated there), it seems logic that in the coming 25 years the Olympic Winter Games could be organised in, let's say, Johannesburg. That would be fun! We got all the way to the top of the hill, where the departure tower of the biggest of two ski jumps now contains a tourist shop, along with an overenthusiastic person called Hans who loves to tell you all about it. We arrived there but had no intentions of really going into that towerthing, I was already happy with the view I got. But Hans insisted and H�rvard paid 60 Kroners to get in and we enjoyed a cup of black berry tea at a point where athletes normally sit before they take off. These athletes even practice here in the summertimes. How? Well, ceramic plates with a certain structure give the same glide as snow does and after a jump the athletes will land on ground of plastic grass. How would it sound if I went ice skating on a lake in the middle of a summer? "How do you want to do that?" "Well, I will use my peddles too!" It was hard to leave the ski jump tower area as Hans kept calling us back, to give me a piece of rock where the ski jump has been built on, or give me a photograph of previous times, or give me a Olympic pin for my backpack. And on the sixth time we were already up the hill near the car, when he yelled from their the tower: "Have you contacted the local newspaper already?" Hans really loves his job. And with a handful of souvenirs from the Olympic Park we drove to the city centre of Lillehammer where H�rvard would take me out to eat at Peppe's Pizza, the Norwegian competitor of the Big yellow M.
H�rvard had invited some of his friends too, so I had an interesting time eating big pizzas with Trond, Annegro, Hallvar, Stein Erik and H�rvard and me. We talked about what I had done today and everybody seems to know Hans of the ski jumps. Yes, he is a interesting character, but he can sometimes exaggerate a little bit because of his enthusiasm. But while we were waiting for the pizzas, who suddenly joined us on the table? It was Hans, who took another photograph of the ski jumps with him. For me. Someway he knew that I was in Peppe's Pizzeria and he joined for dinner. Hans even visited my website one hour earlier and he remember reading about me in the Aftenposten newspaper of over 4 weeks ago. And he read my yesterdays report and was very amazed by it. He liked to repeat everything I wrote in it and told me I was right in certain things. But I didn't really want to talk about my project, because that is not what this life I am living is mostly about. It's about the people I meet and the people I am with. I found myself in a far travelled group of people in that pizzeria. H�rvard has been around the world before and Annegro had travelled through India and Asian countries. They both agreed that the Indonesian island Bali was almost the worst place to go. For H�rvard it was because of the amount of commercial buildings there, nothing is authentic anymore, everything is built to accomodate more and more tourists and the beaches aren't that white as before. I have lived in Indonesia for five years, over 20 years ago, I bet that H�rvard had never seen the other side of the Bali island yet. That's where the Indonesians live and where the beauty can still be found. But with me telling this little secret, don't tell it to anybody else! Annegro told me how she once visited a wild monkey forest on Bali and when she was given a banana by a park employer, she got attacked by a monkey and even got bitten in her hand. The only thing she wanted, at that moment, was to get off that island. I made fun of her and told that it is an Indonesian thing to give bananas to tourists when they go into the wild monkey forest. Candid cameras in the trees would film all those frightened tourists, giving the Indonesians another amusing night of fun television. The program would be called Fouling Around with Tourists and a big prizes could be won with the most original joke. Of course none if it was true, but I almost made Annegro believe it. "Yes, it's true. I might be able to get my hands on a tape with you on it, walking through the forest." "No, I am walking there in my bikini!" "That's okay, everybody there has already seen it. Maybe I can digitalize it an publish it with a link on my website." "No, no!" she screamed, giving all of us quite a laugh. It was a fun dinner, Norwegians are always in for a few jokes. To end a long day of sight seeing, H�rvard and I stayed the rest of the evening at Stein Erik's house and we watched the DVD of The Abbys movie. The Abbys is a great movie about an underwater rig where people have to help out a government investigation to a nuclear submarine that had sunk. But of course they were not the only creatures in the water. It ended up that the Americans were blaming the Russians for the disaster with the submarine, creating big concerns about an upcoming war. That is when the other creatures in the water intervened. To tell you the plot: some species have their own world at 10,000 feet under sealevel and they have managed to control water. They can do anything with it. So to frighten the world and give everybody a childish slap in the face, they underwater creators created massive tsunamis, sky scraper high, which made their way to the shores of every continent. People got scared of hell, everybody paniced and everybody run for their lifes. Just when the high waves were ready to hit the shores, they - freezed. People looked up, amazed and thrilled by what just did not happen, yet. But then the tsunamis would all slowly pull back and disappear in the sea again. The underwaterworld wanted to know they have a lot control on water and that they don't want us people to find on such childish matters with nuclear bombs who could kill complete countries. I just wish the waves could come up again in real life. I think the world needs to realize what were are doing. If certain people disagree with others, they terrorize them. When it ever gets close to a big clash, just think about the tsunamis and dream of living down there, in peace.